LAST NIGHT, We went to see the last Airbender 3D...I liked it, it was a little slow, the longer it got into the movie the better it got. Some of the scenes were Epic; I won't spoil it for you but the water and war scenes are spectacular. 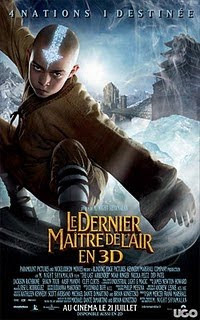 I was quite surprised with Airbender, M. Night Shyamalan does not have a great track record with his movies. Regarding Twilight Eclipse, I will make a comment after I see the first two; believe it, as big as I am a vampire fan, have not been able to get into it. I guess i have a problem with both of them protecting the girl, i hope she has a golden whoha. These two hotties should be going at each other instead of protecting her! Happy weekend everyone, in theaters Twi-hards get their Eclipse and a popular cartoon series becomes a live action movie! First up, fans are rushing to see the newest installment in the teenage vampire series The Twilight Saga: Eclipse. The battle between vampires and werewolves heats up in the third Twilight movie. Graduation looms for Bella Swan, but bigger life changing events await her. She's forced to choose between her true love (vampire) Edward Cullen and her friendship slash repressed love for (werewolf) Jacob Black and the two are battling it out to win her heart. But wait, there's a bigger threat as a malicious vampire's quest for revenge is directed at Bella, and the werewolves and vampires have to team up to save her! What?? The entire cast is back including Kristen Stewart, Rob Pattinson and Taylor Lautner. The Reel Deal: Frankly, if I were Edward or Jacob (and Jacob and I are sporting similar ab regions) I wouldn't fight any harder for Bella than I would, say, a stale cheese sandwich. I don't quite get the whole Kristen Stewart thing. But on the grounds that Eclipse is the best twilight movie yet, the fans will love it. I'm in. Up next, a hit TV show makes its way to the big screen in The Last Airbender. In this fantasy adventure, the world's natural elements, air, water, earth and fire are being used to fight a brutal war. Caught in the middle of combat is the young "Aang", the one ruler with the power to manipulate all four elements. Aang joins forces with other "airbenders" to restore balance to the war torn world. M. Night Shyamalan directs and the movie is rated PG. The Reel Deal: M. Knight Shyamalan-remember when-ahh never mind. For what it is, Airbender is as good as Twilight. It's not great by a long shot, but I suspect those of you who buy a ticket to see it will be perfectly satisfied that you did. So, I'm marginally in. Also in theaters this weekend The Girl Who Played With Fire is based on the second novel from the best selling millennium trilogy by Stieg Larsson. Oscar winners Helen Mirren and Joe Pesci team up in Love Ranch -- the story of one of the first legalized brothels in Nevada.